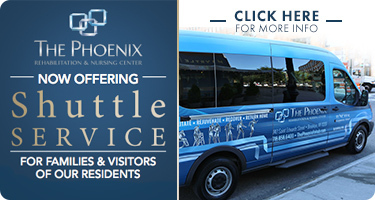 Welcome to The Phoenix Rehabilitation and Nursing Center, an 11-story, 400-bed community serving the subacute and long term care needs of Brooklyn’s multicultural population with distinction. Located at the cusp of Brooklyn, just two blocks from the Manhattan and Brooklyn Bridges, The Phoenix provides panoramic views of the NYC skyline and nearby Fort Greene Park. Today, under new ownership, we are creating an inimitable, revitalizing Rehabilitation Environment to provide the short term patient with a luxurious, five-star experience that meets and exceeds all expectations. A CareRite presence assures you that “RENEWAL™ Happens Here” We are excited as we move forward and embrace change, renovating our entire community and expanding our Rehabilitation programs to better serve the community. We are also happy to offer a free shuttle service daily from select points in Brooklyn and Manhattan.